As aircraft interior designers seek to achieve modern, light-filled cabin environments, they require a range of transparent materials that meet the industry’s vertical burn standards and are amenable to different processing technologies. 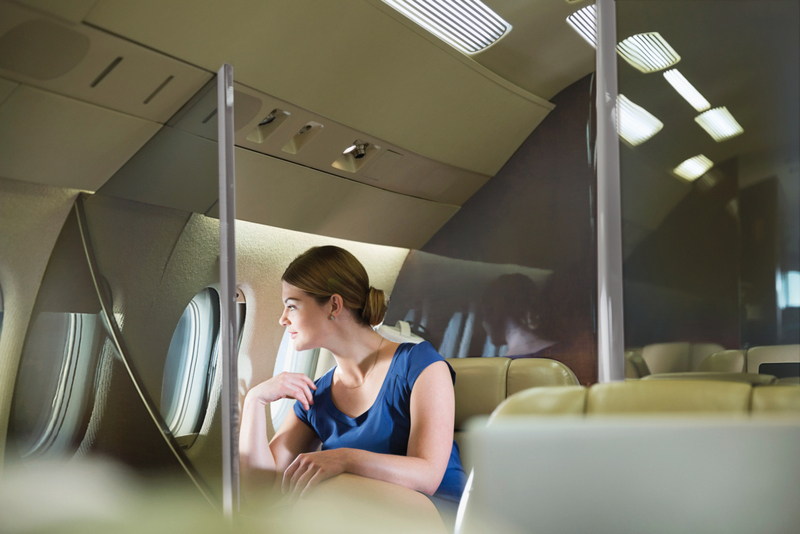 To meet this need, SABIC has announced the expansion of its LEXAN XHR2000 sheet series for aircraft interiors today at the Aircraft Interiors Expo Seattle, with two new variations that come in one- or two-sided hard coat options, called LEXAN XHR2HC1 and LEXAN XHR2HC2 sheets. These additions to the product line now provide design engineers with pre-coated materials that – without the need for secondary processing – meet the highest industry standards for flame resistance. “The industry’s response to the initial introduction of our clear LEXAN XHR2000 sheet was so positive, we created two additional coated variations to help our customers more rapidly advance their designs into applications without requiring secondary operations,” Kim Choate, Director of Mass Transportation for SABIC’s Innovative Plastics business, said. The innovative LEXAN XHR2000 sheet, introduced earlier this year, came in response to the airline industry’s ongoing desire for a transparent material that would help to differentiate cabin interior designs. With 80% light transmission, the highest level of light transmission available in an OSU-compliant sheet material today, the sheet is both durable and thermoformable, while complying with strict airline standards for fire, smoke and toxicity. However, reaching the industry’s highest standards for vertical burn performance requires secondary processing to apply a coating, laminate or film after thermoforming. In contrast to the flagship LEXAN XHR2000 sheet, because of their coatings, the clear LEXAN XHR2HC1 and LEXAN XHR2HC2 sheets offer even more robust vertical burn performance as well as chemical resistance and scratch resistance properties. These coated sheets meet the industry’s robust 60 second vertical burn performance, and the same smoke density OSU 65/65 heat release standards and OEM toxicity requirements as the uncoated LEXAN XHR2000 sheet. LEXAN XHR2HC1 sheet, coated on one side, is a candidate for items that need to be laminated or printed, such as window reveals, partitions, refrigeration equipment, luxury interiors, walls, security partitions, oversized windows, self-service refreshment stations, instrument displays, divider panels and mirrors. LEXAN XHR2HC2 sheet, coated on two sides, is a candidate for many of the same applications, offering scratch, chemical and graffiti resistance on both sides. “The development of these new coated sheets is one more way SABIC has demonstrated its on-going investment in advanced materials technologies to help aircraft OEMs meet the critical challenges of weight-out, regulatory compliance, customized aesthetics and an improved flying experience,” Choate added. More information about SABIC’s Innovative Plastics business and the range of aerospace grade thermoplastic resin, sheet, film, foam and fiber solutions it offers to aircraft interior customers can be found on at www.sabic-ip.com/transportation and also at https://sfs.sabic.eu/industries/transportation/aircraft-interiors For technical product inquiries, please contact us at www.sabic-ip.com/prtechinquiry.